It’s hilarious, clever, and with some of the best art design and artwork I have ever seen in a game. A lot of love and detail went into crafting the spooky theme of this game, which is reinforced with every token, card and piece of scenery. It’s a fun theme with a great mechanic at its core. It’s co-operative, albeit in a very strange manner. Looking forward to trying this again on the other side of the ghost screen. And if you’re wondering exactly ‘how’ surreal the cards are, mouse in a top hat with abacus is not made up. It’s lifted directly from the game. I mean, we couldn’t have made up more bizarre examples if we tried. Playing as the ghost, it was very funny seeing what odd interpretations the other players managed to wrangle from cards I chose for really, really simple reasons that I thought were obvious. One exciting piece of news this week is that we are going to be guests on the Podcast of @boardroomcast – it’s a fun podcast about, wait for it, board games! Which I guess is why they invited us on? It’s happening Wednesday at 8PM (tea and crumpet time, i.e. GMT) so you should check that out. They live cast via @zcastapp which uses twitter to allow listeners to live chat while they listen. It seems to be a great way to broadcast. Anyway, if you’ve ever read Tiny Wooden Pieces and all you could think was “yeah that comic is good and all but what do they sound like” then that’s kind of odd, but now you can find out. So give @boardroomcast a follow and they’ll be tweeting reminders about the show. We look forward to chatting to you while we talk about board games live on the internet! Oh, 21st century, you’re everything I hoped you would be and more. Codenames is a game we really want to play as well. Sounds like a lot of fun, it’s very high on our “to buy” list right now. I love the sparkle. We have Mysterium and our first couple of plays didn’t go so well. Played with my family of 5 where my daughter, 14, was the ghost. I think she was getting frustrated that we weren’t getting the messages she was psychically sending our way. I’ve been trying to get them to give it another try with me as the ghost to see if we can salvage this one. I’ve heard nothing but great things and was disappointed our experience was less so. Our game playing time is so limited, it’s hard to convince them to retry a game that didn’t work the first few times out. Sparkle. Sparkle. Thanks for the lovely words on my sparkle! I’m now recovering from my head cold, and your encouragement just gave me +4 to sparkle. I’m like a My Little Pony right now. I guess Mysterium is one of those games where the right group/experience is really important. I can see how people could get frustrated as either the ghost or one of the psychics. Luckily in our group we had a nice balance of players which led to that being funny rather than frustrating. I hope you have better luck next time, it’s a game with huge potential for fun. Thank you! And I love the fact that you came up with a really well thought out, mildly complex system … and had no luck with it. I look forward to playing more Mysterium. I think it’s going to create a lot of fun experiences and memories for us, which is the best thing you can say about any game, really. Saw this game everywhere at PAX Aus – it was the game of the show. It was quite cheap too and I very nearly picked it up. Didn’t get to play it but I can see the central concept and theme being perfect for large gaming get togethers. It actually plays up to 7, which is a nice number. One of those games that states 2-7 players, but I’m pretty sure 3 would be the minimum, and 4+ the recommended number. Definitely give it a go if you get a chance. Ah Mysterium, great game. I’ve yet to win one but surely the next time our group will actually be able to interpret the ghost’s clues correctly… Right? We did end up losing the game that comic was based on. Eager to play again, though, everyone had a lot of fun. Seems like a tough game to win though, and that was on easy mode. I discovered your comic last week through Thirsty Meeples, and now I’m all caught up! 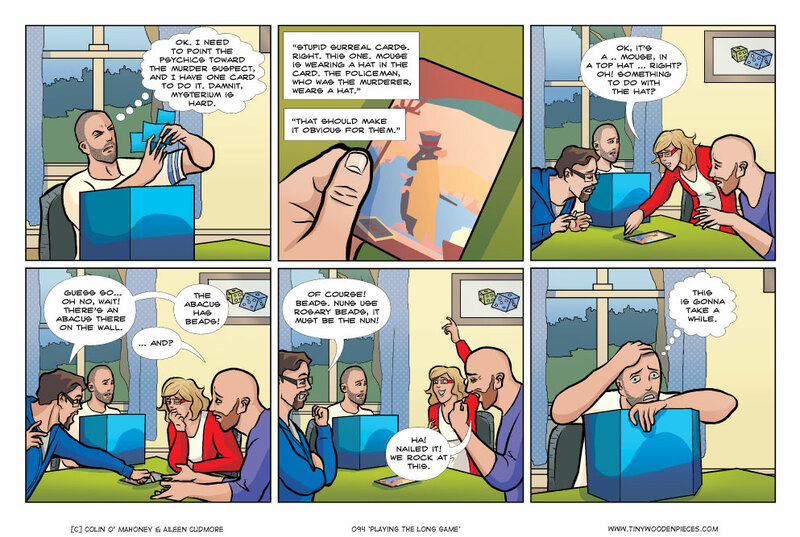 I wasn’t paying attention to the dates each strip was posted, so was secretly hoping they’d just keep going….really amazing stuff guys, although board games and comics are possibly my two favourite things, so I may be a bit biased! Mysterium sounds awesome – I’m a massive fan of Dixit, Codenames and the like, and my partner loves ghosts, so sounds like it should be a winner! I’m going to the Thirsty Meeples at the weekend, so hopefully they’ve got a copy in stock…. Thanks for the kind words, Hywel! We’re super-jealous you live near enough to visit Thirsty Meeples, there are no board game cafes yet in Ireland, but we live in hope. I think if you like Dixit and Codenames, and ghosts are in the mix as well, then Mysterium will definitely be a winner. It’s huge fun. Tell Thirsty Meeples we said hello, and thanks for the mention in their newsletter!